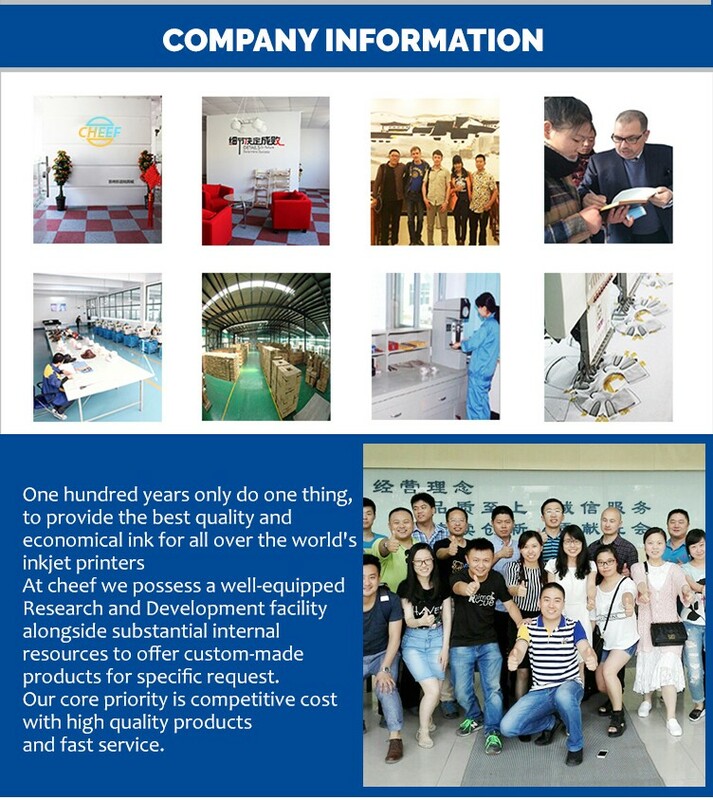 Optical-counterfeiting ink,High-temperature ink ,low-temperature ink and so on! What is the Details for anti-mobility inks used on cable industry ? 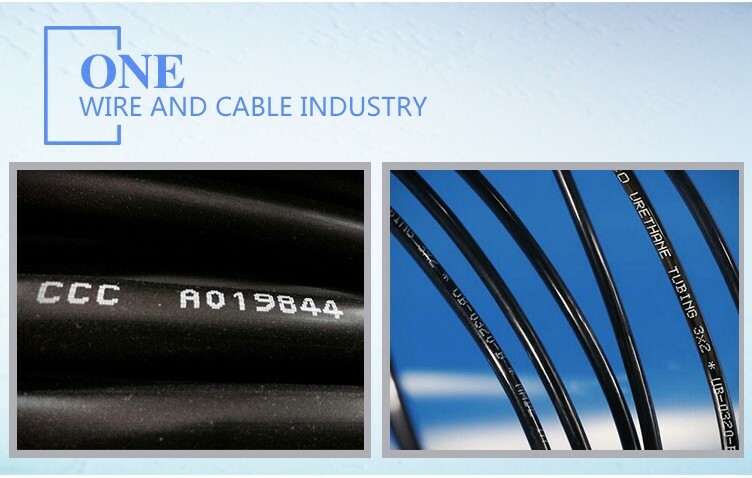 Non-contact inkjet for Cable Identification, easy guaranteed rate can save time, ensure the quality of final identification. 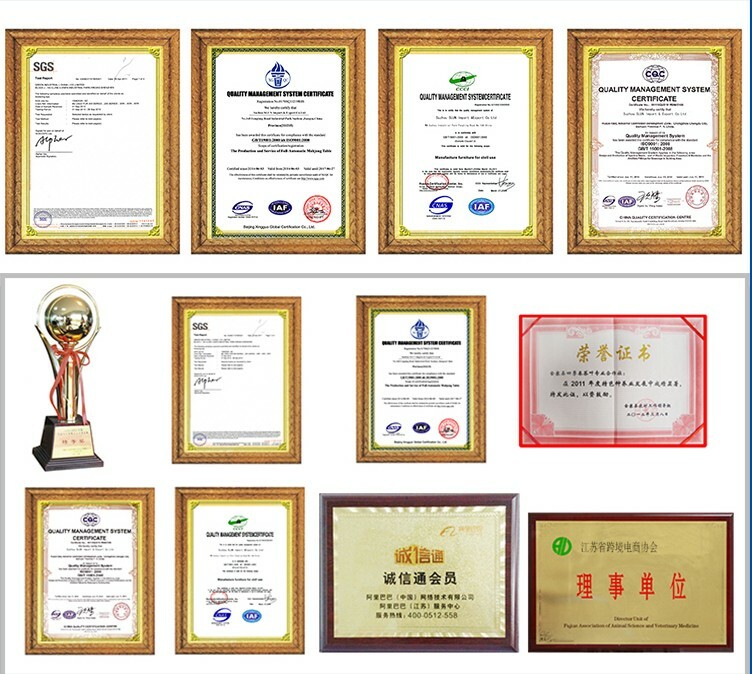 Non-contact inkjet ink jet method is decided by the way it works, especially the small character ink-jet printer. 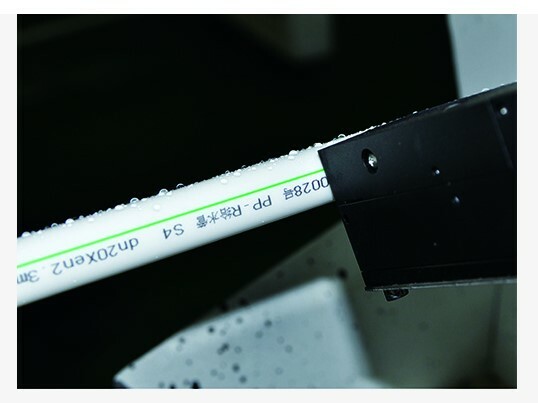 cable production line does not need to spend more time on the label. Q1:What is your main products of ink? 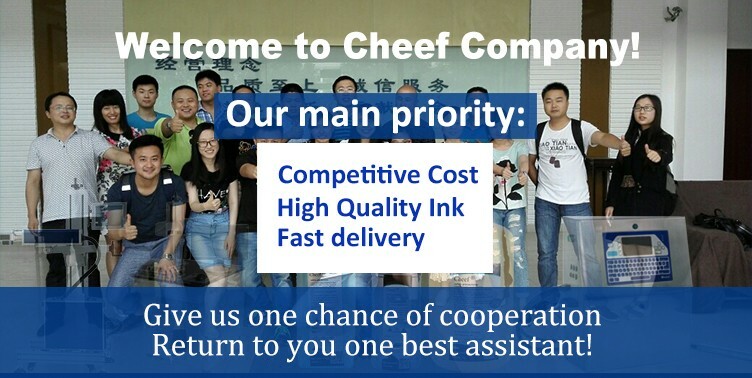 A:Cheef ink manufactures a full line of high quality, low cost alternative inks, makeup, and cleaners for Continuous Ink Jet (CIJ), Drop on Demand (DOD) and High-Resolution industrial printers and coders. Innovative technology is the core of our business, and our inks are trusted alternatives to products from many OEMs including Videojet, Domino, Imaje, Marsh, Citronix, Linx ,Metronic,Rottweil,and more. Q2:Which products your ink can be used ? A:Cheef ink can used on metal, glass, PVC, other plastics, and laminated paper with pigmented inks for use on darker substrates and available in white, gray, silver, and light blue,and so on. Q3:Which industry of your ink used? 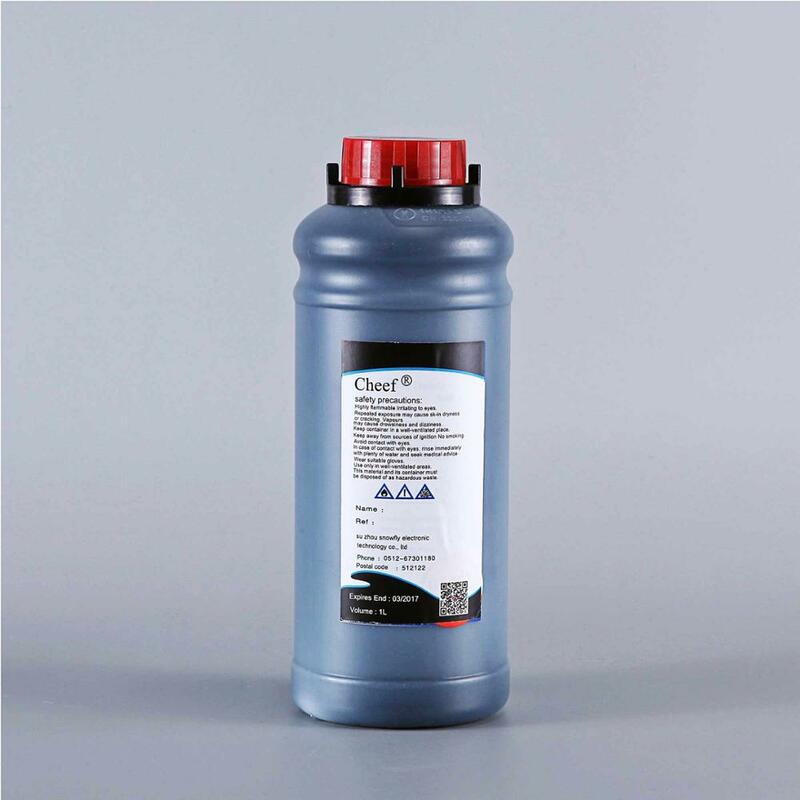 A:Cheef inks are used in a wide variety of industries for many different applications, including the automotive, food, beverage, electronic, consumer products, wire cable, pharmaceutical Industries and so on. 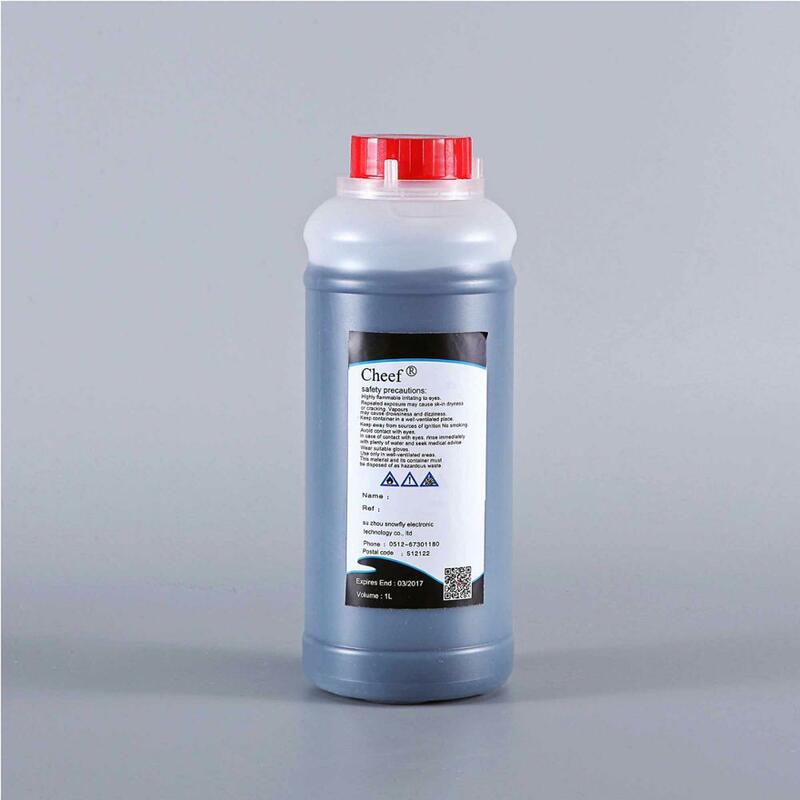 A:Yes ,cheef ink can develop the inks for use in your current coding and marking equipment. Whether the ink you’ve been using is out of stock, been discontinued, too costly or under performing, we can replicate and improve upon OEM manufactured ink. 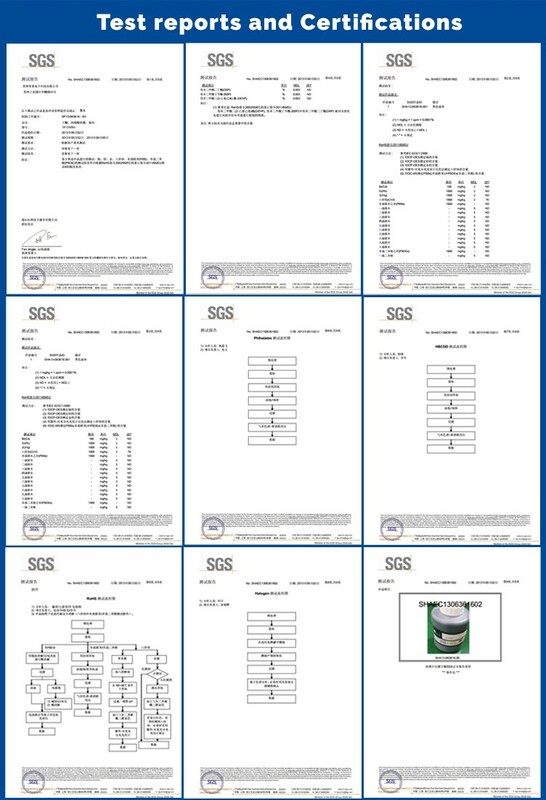 The most important is these inks are guaranteed compatible with your equipment. Just change out the ink, possibly run a flush, and you’re ready to go. Q5:How is your ink quality? A:All of our inks are developed in our on-site lab which enables us to design and manufacture inks and fluids for the most difficult applications. We use only the highest quality dyes, pigments and materials in our inks.Our Custom ink successfully cover the most demanding manufacturing requirements. Our dye-based CIJ inks is suitable for most applications and is available in a vast range of solvents and colors. Q6:How many colors of your ink? 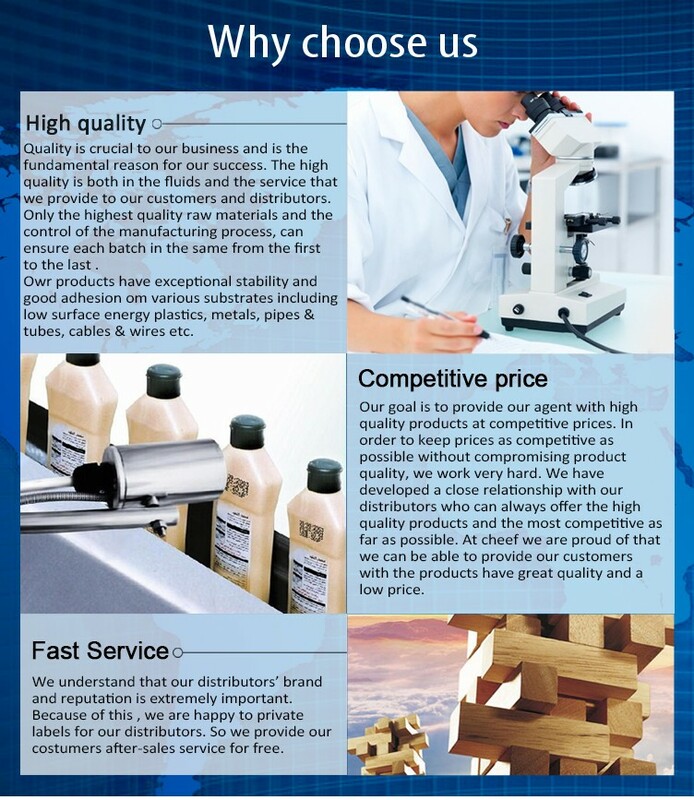 A:We can produce the ink according to your request , and customize your color of ink, and make your own private label. Our soft-pigmented CIJ inks deliver codes in intense colors such as yellow, red, and green, using a standard printer. Q7:What is main priority of your ink? A:At cheef Ink we possess a well-equipped Research and Development facility alongside substantial internal resources to offer custom-made products for specific applications. 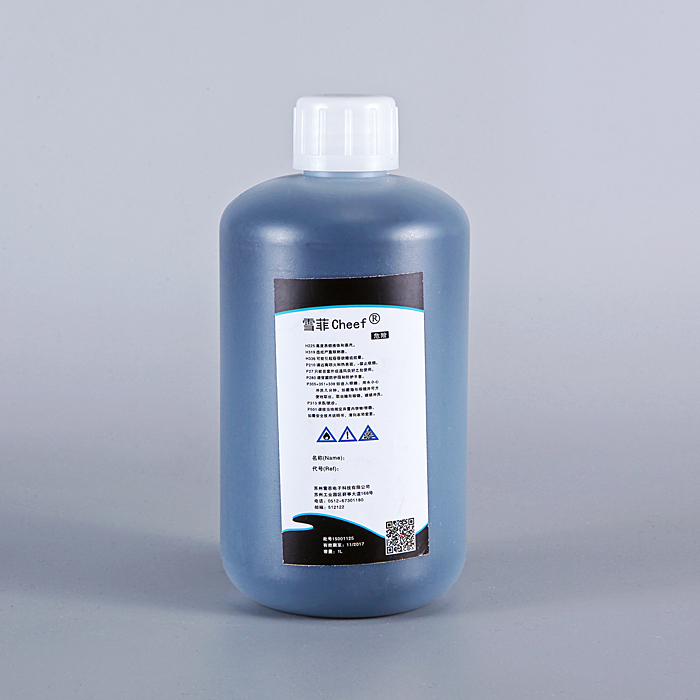 DOD inks are carefully formulated using a four-stage filtration process, ensuring no sediment, sludge or residue. This minimizes print head maintenance and results in less downtime. A:Yes, sure, you can try sample and do the test before bulk order. Please contact us now, and let us do your best partner, you will save money,cost and time. 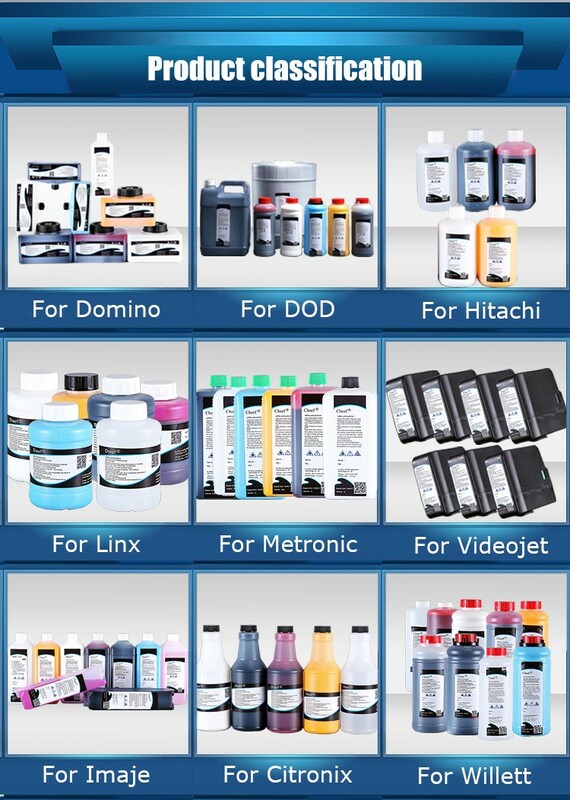 Q9:How to choose our ink which applicable to our printer? A:You can tell us your ink model or printer name ,or which product you printer printed, and which color of ink you used, we can provide with you corresponding ink. Q10:For the first time ,how can I trust you? 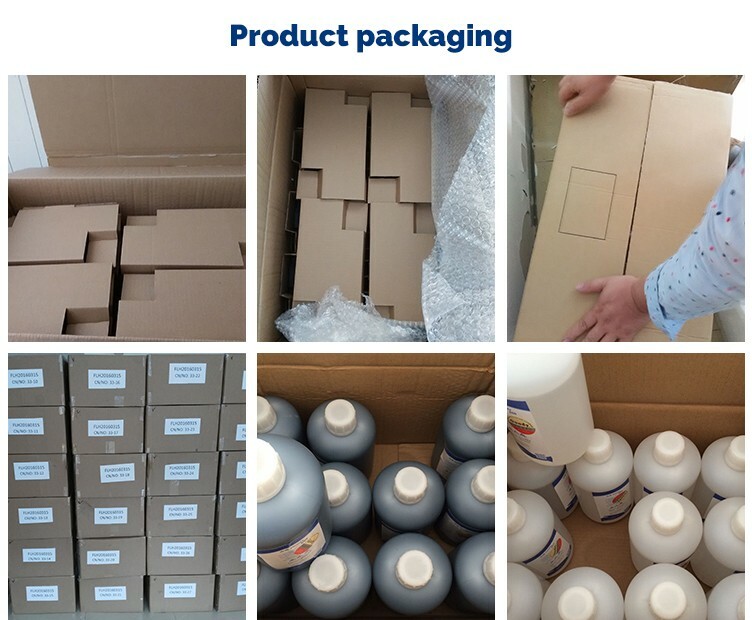 A:Firstly,we think trust are built by little and little, for the first time, you can try a little sample from us, to check our ink quality and check our service,and after the experience, we believe you will like us and be willing to let us be your partner,the most important thing is ,we think business is for long time, not just only once,so ,every client , we treat them as our long time cooperator, it is our company culture.Just contact us now to try it. Q11:Except products, what you can provide with us? A:Our engineers are available with 24-hours hot-line to give you technical assist, we can solve issues within a wide area ranging from the traditional printing or marking methods to providing high-tech ink-jet fluids,characterization and optimization of various properties including print quality and functional performance. Q12:How we can contact you? 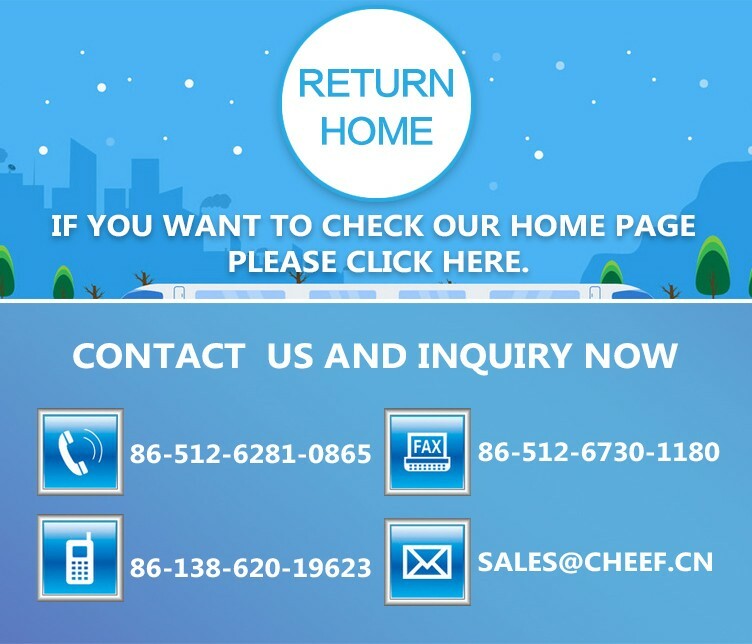 A:You can give us inquiry as below on alibaba, or contact us by below method. Ipadala ang iyong pagtatanong sa mga produktong aming magandang kalidad nahigh quality anti-mobility cij inkjet printer inks used on cable industry.